Being labelled as one of the most prestigious areas to live in Vancouver, life in Shaughnessy comes with a price – a very hefty price. Listed at $9,530,724 USD / $10,500,000 CAD is this 1930s home desperately seeking somebody to bring her back to her former glory. Sadly the day will likely never come. The listing description is quick to say, “Custom build an estate home complete with detached coach house,” that’s right folks, that means we have a “tear down” on a 0.67 acre “building lot” listed at $10,500,000 CAD! The ad does say one may want to, “redevelop the property as a multi-unit strata, or restore the current 8,000 square foot home” – which we know won’t happen. It is located on a busy corner lot along Granville Street roughly 7 minutes from Downtown Vancouver. Not the life for you? 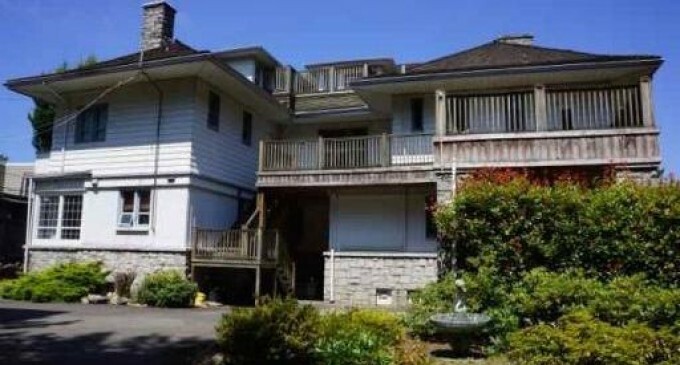 Scroll down to see some of the dream properties we found, each with a list price cheaper than this “tear down” in Vancouver, BC. Roughly 34 minutes from Downtown Austin, Texas you can purchase this magnificent 5.15-acre estate complete with 15,394 square foot main house enjoying panoramic views of Lake Travis. The Italian Villa was built in 2004 and includes 6 bedrooms, 13 bathrooms, a library, wine cellar, home theatre, indoor basketball court, and an infinity edge pool with slide & waterfalls. As a bonus a boat dock is also included in the sale! This stunning custom home can be yours for $9,500,000 USD / $10,469,946 CAD. It’s listed with Amy Mills of Realty Austin. If you’d prefer to live oceanfront then this might be the place for you. Spanning 4,600 square feet on 1.58-acres this architecturally stunning residence is perched in Otter Cove with endless breathtaking ocean views. It was created by renowned builder Bill McLeod in 1988. The home offers 4 bedrooms & 5 bathrooms, built ins, and a solarium indoor pool with endless ocean views. It’s a short 12 minute drive from Downtown Carmel, California. You can purchase this unbelievable home for $9,500,000 USD / $10,469,946 CAD. It’s listed with Ben Heinrich of The Heinrich Team. For $329,000 less than the fixer upper in Vancouver you can secure your own piece of heaven in Malibu, California surrounded by dramatic mountains. Over 14 acres of private grounds with a swimming pool, self-sufficient water supply, and helipad. The home was designed by Architect Ed Niles and is commonly referred to as “The Henman House.” The steel & glass structure includes 4 bedrooms, 5 bathrooms, huge entertaining areas, and a lavish master suite. It is located about an hours drive from Downtown Los Angeles, but within minutes of several beaches. As a bonus you’ll have bragging rights for owning a home featured in a number of Hollywood films! It can be yours for $9,200,000 USD / $10,139,316 CAD. It’s listed with Marc Silver of Sotheby’s International Realty. If you’re a bit of a space nut then you will absolutely love this 34.38-acre escape in Edwards, Colorado. Ideally situated atop a majestic ridge spanning the renowned Lake Creek and Squaw Creek valleys, this magnificent contemporary mountain estate offers privacy, breathtaking views, and unmatched luxury features. One of the homes most unique features is a professional telescope observatory which is accessed via an open-sided glass ceiling elevator. The home also includes a state-of-the-art indoor tropical greenhouse that provides year round fruit and vegetables, an impressive fleet of solar panels that provide half the energy for the 10,561 square foot home, and a pond providing geothermal heating and cooling. All this is just 30 minutes to Vail and Beaver Creek. You can start your space exploration in your private observatory for just $9,000,000 USD / $9,918,896 CAD. It’s listed with Matthew Blake of Ascent Sotheby’s International Realty. Click here to view a complete virtual tour of the home. Money can’t necessarily buy happiness but it sure can buy a beautiful home! Listed at $8,888,000 USD / $9,791,910 CAD is this 4,543 square foot architectural home set on its own 0.82 acre promontory behind private gates. It was originally designed by Harry Gesner and renovated by Dean Larkin Design. Enjoy stunning panoramic views from expanses of floor to ceiling glass and from the edge of the infinity edge pool. The master suite is situated in such a way to allow views of the Hollywood sign and the city skyline. All this is located just 19 minutes from Downtown Los Angeles & 19 minutes from Rodeo Drive for shopping. It’s listed with Jason Oppenheim of The Oppenheim Group. If you’re impressed with detail then you might just fall in love with this property. Originally priced at $19,900,000 you can now get this palatial nearly 18,000 square foot French Chateau for $8,500,000 USD / $9,367,846 CAD. That’s right – this property is listed $1,030,724 USD / $1,135,960 CAD less than the dilapidated “tear down” in Vancouver, BC. The 17,879 square foot mansion sits on 10.4-acres overlooking Lake Grapevine in Flower Mound, Texas. The main house is beautifully appointed with imported stone, venetian plaster, and custom wood work throughout. There is also a 3 bedroom guest house complete with living room & kitchen as well as a 2 bedroom carriage house. Other features include a 3-stall barn, impressive mosaic tiled resort-style swimming pool with swim-up bar, and extensive covered terraces. All this is located a short 38 minute drive from Downtown Dallas, Texas. To view all the photos of this property click here. It’s listed with Troy George & Lucy Noonan of Synergy Realty. Located just 17 minutes from Downtown Tampa, Florida is this impressive 28,893 square foot English Jacobean Country Estate on 5.9-acres. It’s surrounded by a golf course, pond, and conservation. Originally priced as high as $25,000,000 you can now purchase this beautiful estate home for $8,500,000 USD / $9,367,846 CAD. Enter in a grand foyer and discover 10 bedrooms, 10 full & 3 half bathrooms, a grand ballroom, panelled library, elevator, wine room, and 14 fireplaces. It’s listed with Dianne Martin of Century 21 Shaw Realty Group. Rare chance to purchase the largest home for sale in Broward County, Florida on 10 acres with 4 acres being agricultural excempt. Approximately 25,000 square feet with east & west wings, 7 bedrooms, 8 full & 2 half bathrooms, as well as a separate guest house which would be ideal for an artist/recording studio, or an events centre. The current owner has spent $14 million on the mansion and it can now be yours for $8,000,000 USD. HGTV’s Million Dollar Rooms visited the home to film the palatial 3,000 square foot master suite which includes a $500,000 walk-in closet. Other features include cathedral ceilings, 30′ ceilings, multiple terraces, and a resort-style swimming pool. It’s located a short 33 minute drive from Miami, Florida. It can be yours for just $8,000,000 USD / $8,821,599 CAD. It’s listed with Roman Pavlik of Keller Williams Eagle Realty. A little more than $1,500,000 USD less than the “tear down” in Vancouver, BC is ‘La Piedra’ sitting on 2.25-acre lot at the top of a hill overlooking Palm Springs in the famed Community of Southridge. La Piedra is a neighbour to the legendary Bob Hope Estate and the homes of other celebrities. Over 7,500 square feet which underwent a complete remodel in 2005. Over 700 tons of hand cut Idaho Quartz stone was used when originally constructed. Enjoy an opulent pool and spa & rooftop putting green and shuffleboard. Listed at $7,990,000 USD / $8,810,572 CAD with a replacement value in excess of $20,000,000. Listed with Jenell Fontes of Windermere Real Estate. Easily one of the most unique homes in all of Illinois. Enjoy a custom modern 17,000 square foot mansion complete with 6 bedrooms, 10 bathrooms, three media rooms, over 150 lighting zones, 87 security zones, 14 stereo zones, and indoor & outdoor pools about an hours drive from Downtown Chicago, Illinois. The residence is set on 26-acres, with a 5-acre Japanese garden, this estate is truly one-of-a-kind. It can be yours for just $7,900,000 USD / $8,711,329 CAD. It’s listed with Debra Dobbs of Koenig Rubloff Realty Group. Not exactly the type of home you’d expect to see in New Jersey. This stunning mountain luxury mansion is situated on a sprawling 125-acre estate enjoying commanding views and majestic sunsets. In addition to the 18,000 square foot mansion is an attached two bedroom apartment with private entry. In total the estate offers 7 bedrooms, 7 full, and 4 partial bathrooms. Beautiful detail throughout with an array of woods including black walnut, ash, elm, cherry, pear, maple, mahogany, wormy chestnut, and hickory. Enjoy a swimming pool, tennis court, and regulation squash court. It can be yours for $7,900,000 USD / $8,711,329 CAD. It’s listed with Deborah Smith of Turpin Real Estate. This impressive 17,523 square foot home dates back to 1900 and is situated on a generous 2-acre parcel of land. The classic English Manor has been meticulously expanded and restored to the highest specifications of David Rosen AIA. Enjoy grand-scale spaces including an eat-in gourmet kitchen, butler’s kitchen, formal dining room, and formal music room. This grand estate is located just 30 minutes from New York City and be yours for $7,599,000 USD / $8,379,417 CAD. To view a high resolution tour of this fabulous estate click here. It’s listed with Arlene Gonnella of The Gonnella Team. For just $7,495,000 USD / $8,264,736 CAD you can purchase one of the most prized homes in Winnetka, Illinois. Set on a 1-acre estate fronting Lake Michigan is this fairytale home spanning 6,350 square feet with 5 bedrooms & 6 bathrooms. Beautiful grand formal rooms, a stunning kitchen, and two first floor master suites are what you have to look forward to. It was built in 1928 and also includes a temperature-controlled conservatory, grill room, two wine cellars, and an underground garage. Own it for $7,495,000 USD / $8,264,736 CAD. It’s listed with John Baylor of @properties Winnetka. If you’d prefer to stay close to Vancouver but can’t quite afford to live in Shaughnessy then you might be interested in this fabulous 0.61-acre home in the Altamont area of West Vancouver, BC. Originally designed by Gordon Hlynsky in 1996 with over $3 million spent on a complete renovation in 2012. Almost 8,200 square feet on three levels plus a motor court and a three car garage. Some of the features include wide plank, white French oak floors, custom iron work by Maca Studio, state-of-the-art home theatre, gym and games room with wet bar, wine cellar and incredible guest accommodation. It’s located about 18 minutes from Downtown Vancouver and about 24 minutes from the “tear down” in Shaughnessy. It can be yours for $6,436,000 USD / $6,998,000 CAD – an entire $3,094,724 USD less than the “tear down.” It’s listed with Brock Smeaton.